HESPERIA, Calif. -- Authorities on Saturday called off the search for a missing 2-year-old boy who had been involved in a crash that killed his mother and brother when their vehicle overturned into an aqueduct in Hesperia on Thursday. 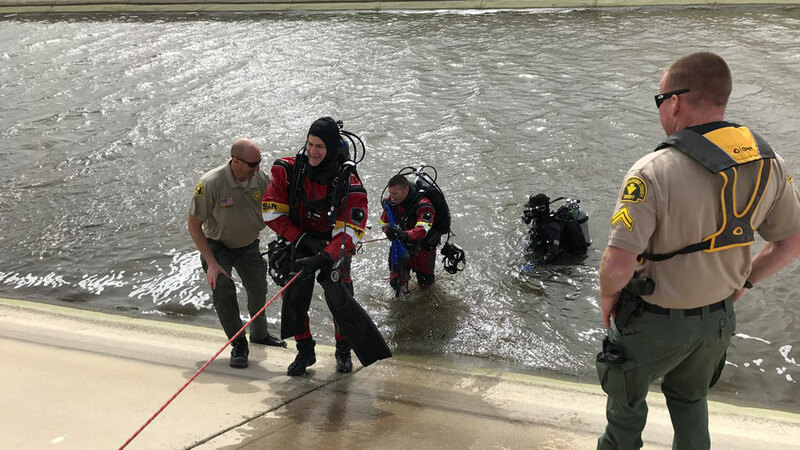 Noah Abbott had been sought by members of the San Bernardino County Sheriff's Department Dive Team, who again scoured the frigid water for hours on Saturday amid strong currents and zero visibility. "Our hearts are broken that we couldn't bring closure to the family," the team's commander, Lt. Doug Wolfe said on Twitter. "We are truly sorry for their loss." Noah's mother, 31-year-old Christina Eileen Estrada, was pronounced dead at the scene after the collision about 6:45 p.m. Thursday. Her 3-year-old son Jeremiah Robert Abbott was rushed to a hospital, where he died. Elijah Estrada, brother of Jeremiah and Noah, was rescued after he was found clinging to a float. He was later released from the hospital.